In the beginning of our era, the Friesian horse already was a favourite battle horse. At around 150 A.D., Roman historians wrote about Friesian troops in Britannia near Hadrian’s Wall, between Scotland and England. In the 4th century A.D., the famous English writer Anthony Dent describes the presence of independent Friesian troops near Carlisle. They cared for their own horses and weren’t listed as regular troops. Most probably, these were Friesian mercenaries with Friesian stallions. Anthony Dent, amongst other writers, also mentioned that Friesian horses formed the basis of ‘the Old English Black’, the ancestor of the famous British Shire horse breed and the Fell pony. The latter in particular now still shows a striking resemblance to the Friesian horse. During the Battle of Hastings on October 14th 1066, William the Conqueror used horses which strongly resembled Friesian stallions. The many illustrations of knights and nobles on the battle field show horses that were called Friesians at the time. The first written proof of the name ‘Friesian horse’ was found in a declaration: in 1544, the German Elector Johan Frederik von Saksen arrived on a Friesian stallion during the Reichstag in Spiers. Three years later, in the midst of the battle of Muhlberg, Johan Frederik rode his stallion and clearly attracted a lot of attention, because Emperor Charles V recognized the man from afar just by looking at his horse. In Naples in 1568, a very famous etching was made of Phryso, the stallion of Don Juan of Austria. During the 17th century, Friesian horses (and also Spanish horse breeds) could be found in several riding schools where the “Haute Ecole” of equitation was practised. At the time, the Friesian horse was not only a favourite horse for the “Haute Ecole”, it was also a desirable carriage horse. During the 18th and 19th century, the use of the Friesian horse becomes more and more limited to northern part of the Netherlands, now known as the province of Friesland. Undoubtedly, the decay of the upper-class on the European mainland after the French Revolution is partly to be blamed. In the Friesian countryside at the end of the 19th century, the Friesian horse became an expression of the owner’s wealth. Wealthy peasants went to church on Sunday with their gig pulled by a pair of Friesian horses. Moreover, the horse was also used for ‘pleasure riding’ such as short track trotting races. This was called riding ‘under the saddle’, or to be more specific ‘without saddle’, because traditionally the horse was ridden with just a small orange blanket on its back. Since this period, the Friesian horse has known a couple of famous trotters and it is almost certain that this type of horse was used in the breeding of the Russian Orlov at the time, and also in the developing breeding of American trotters. At the end of the 19th and the beginning of the 20th century followed a very difficult period for the Friesian horse. During this period, the Friesian horse had to compete with heavy horse breeds such as the Gronings-Oldenburger, the so-called ‘Bovenlanders’. This competition battle almost proved fatal for the Friesian breed… Besides occasional recreation in the form of a ride in front of the gig and tilting-the-ring competitions on Sunday, there was a lot of heavy work to be done on the farm. However, this horse with the blood of a ‘noble country gentleman with a talent for dancing’, wasn’t entirely suited for this role… As a result, many farmers ended up choosing for the ‘Bovenlanders’, which were especially bred for this heavy work, or crossed their Friesian horses with heavier breeds. This almost became the end of the Friesian breed. 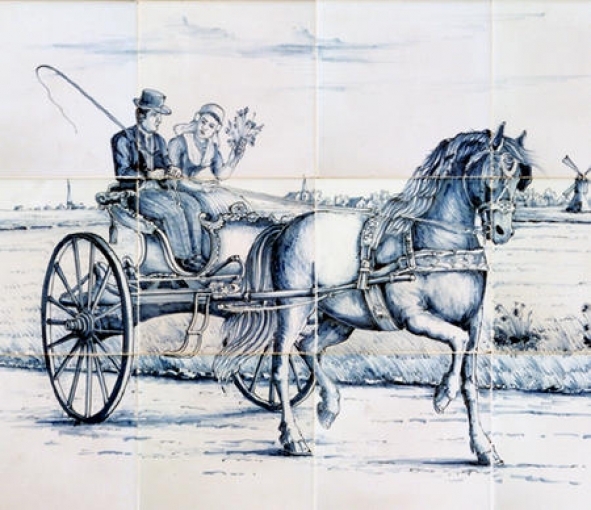 It was around this period that about a hundred Frisians got together in the ‘Oranje Hotel’ in Leeuwaarden and founded an association for Friesian horses in addition to the studbook in order to preserve it from its seemingly inevitable extinction. Thanks to well-considered and professional breeding- and purchasing policies for the remaining full-blooded colts that showed sufficient quality, new life was breathed into the breeding. And with success: it preserved the Friesian horse from extinction. Next to its fantastic appearance, the Friesian horse has a character that is marked by intelligence, friendliness, adaptability and its enormous willingness to work for humans. It’s this character in particular that has contributed to the fact that through the centuries there have always been people willing to do anything to preserve the breed. 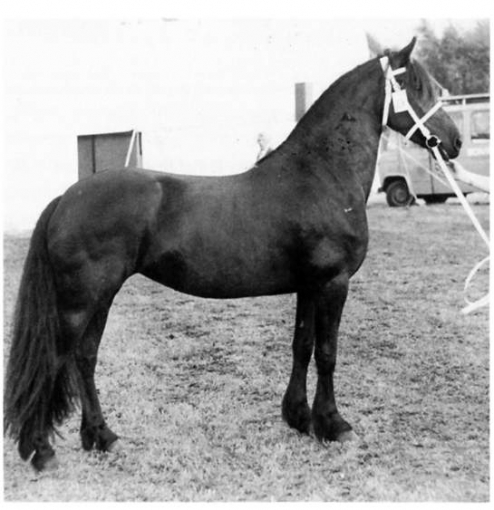 During the 1960s followed another crisis in the breeding of horses. The reasons of which were much more irreversible and inescapable than those of the crisis in 1913. Back then, the problem had centred around the competition between horse breeds at a regional level. Now, the problem was the worldwide discontinuing of the use of horses as a source of power in agriculture! Within just two decades, the Friesian horse took a spectacular lead over many other horse breeds. Once again, the Friesian horse’s exceptional kindness, intelligence and honest character are of decisive importance. The Friesian horse’s character is extremely fit for recreational use by people who haven’t been raised with horses. Within a relatively short period of time, its possibilities for pleasure riding and competition were rediscovered. People looking for relaxation and adventure learn to know which fantastic characteristics the Friesian horse possesses. Possibilities which can only really be understood when we know about the Friesian horse’s history; possibilities which have been anchored for centuries in its genetic potential. The Friesian horse appeared to be an ideal partner for all kinds of driving purposes. But also its dressage potential was soon rediscovered. The Friesian horse had begun its great comeback. 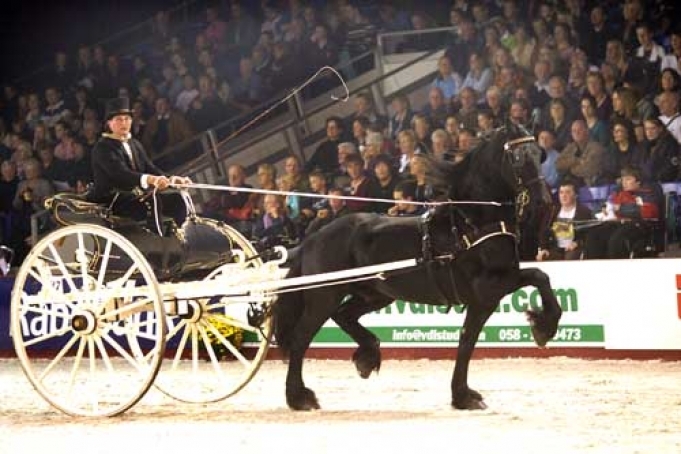 Famous four-in-hand drivers such as Tjeerd Veldstra and Leo Kraayenbrink appeared in international combined driving competitions with their Friesians. They were also increasingly seen in the higher levels of dressage. But above all, the possibilities of the Friesian horse as a show horse were rediscovered: impressive in show driving, but also in …the circus. The horses first appeared in the Straszburger circus after the war, but nowadays almost no circus exists without Friesian stallions. Finally the Friesian horses got to dance again...!